Teach the Christian significance of this popular children's book with traditional language arts exercises that emphasize the biblical parallels in C.S.Lewis' work. Includes ideas for journals, book reports, and debates; just-for-fun puzzles; recipes; and party ideas. --Note: This book has not been prepared, approved, or licensed by any person or entity that created or published the novel The Lion, the Witch and the Wardrobe, or the film The Chronicles of Narnia: The Lion, the Witch and the Wardrobe. 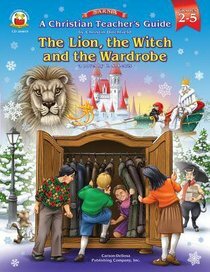 Characters, names, and related indicia of the Chronicles of Narnia and The Lion, the Witch and the Wardrobe are trademarks of their respective trademark and copyright holders. About "Christian Teacher's Guide: The Lion, the Witch and the Wardrobe"
Christin is an accomplished educator, author, conference speaker, and host of the syndicated radio program, Take It To Heart! heard daily on hundreds of stations across the United States, Canada, Latin America, Papua New Guinea, and Muizenberg, South Africa.